Give your special needs playground the accessibility it needs. 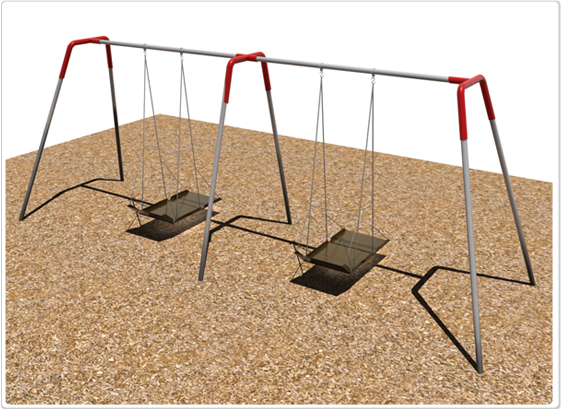 This sturdy commercial-grade swing set structures has two separate wheelchair platforms. • All of the parts that you need to set the system up. This includes four (4) swing hangers, that attach to the horizontal pipe; eight (8) vertical swing chains; and sixteen (16) swing fasteners to connect the chains to the hangers above and the wheelchair platforms below. You can upgrade to sturdier parts and plastic-dipped chains for only a few dollars more per swing. Size: 20′ x 8′ x 6.5′ Use Zone: 32′ x 32′ Weight: 615 lbs.